The approaches we take to assessing learning, the kinds of tasks we assign and the way we report success or failure at school send powerful messages to students not only about their own learning, but also about the nature of learning itself. Assessment and reporting processes shape student, parent and community beliefs about learning – sometimes in unintended ways. 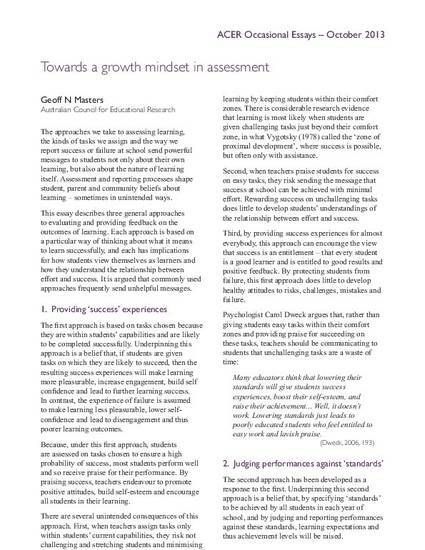 This essay describes three general approaches to evaluating and providing feedback on the outcomes of learning. Each approach is based on a particular way of thinking about what it means to learn successfully, and each has implications for how students view themselves as learners and how they understand the relationship between effort and success. It is argued that commonly used approaches frequently send unhelpful messages.